This is the fourth instalment in a series on media relations measurement. In the this part of my conversation with Wilma Mathews, ABC, author of Media Relations: A Practical Guide for Communicators, she provided an example of a media relations initiative that demonstrates the importance to linking behavioral outcomes to media relations inputs. A staff writer at Arizona State University received an assignment from the archaeology department to write a news release to promote an upcoming lecture: a local attorney, as an amateur Egyptologist, was only the second person to go into an Egyptian tomb. The communicator got two hits from her release. One was in a calendar listing in the local newspaper. The other was to a reporter who likes to write human interest stories. There is no AVE for this program. And the circulation numbers would be small by most media relations measurement standards, because there was only one newspaper’s circulation to include. However, in many ways, this example represents the tried and true in media relations, and the importance of measurement over evaluation. To be successful, it’s important to understand the needs of reporters and only target those journalists or media outlets who would have an interest in your program, your product, your service or your candidate. After going through that process, if your media list ends up being only five outlets — but they’re the right five outlets — you can achieve success with what would be considered to be an extremely low AVE, if any AVE at all. “It’s taken almost as a fact that if you have a million impressions there’s an assumption that a million people saw it and read it,” Wilma said. “You can make numbers do anything you want. But the real bottom line test is: Did your audience do what you intended them to do? Is Tom Mulcair a Q&A Hypocrite? Perhaps I’m jaded, but in my world when people do exactly that for which they criticize others, they’re hypocrites. And Canada’s official leader of the opposition, Tom Mulcair, may be just such a beast. For the past few years, Mr. Mulcair has constantly criticized Canadian prime minister Stephen Harper for not answering questions. “We’ve asked the prime minister a precise series of questions,” he often says, leaving the impression that it is completely unacceptable for someone to not answer those questions. Yet in numerous media interviews I’ve observed, Mr. Mulcair does exactly the same thing. He almost never answers a question directly. In fact, sometimes it seems he wouldn’t answer a simple question if his life depended on it. And it negatively impacts his credibility. I first became aware of this during a radio interview featuring Mr. Mulcair in November 2013 while I was riding my motorcycle home from a media training session in downtown Toronto. I was listening to CBC radio (it’s a Gold Wing with a premium sound system—and heated grips and seats, thank goodness!). Mr. Mulcair was being interviewed about the expense scandal in Canada’s senate shortly after three senators were suspended. Mr. Mulcair was waxing eloquently about how the prime minister refused to answer simple, direct questions during question period in the House of Commons. The prime minister was avoiding questions. He was sidestepping questions. He was waffling. He was obfuscating. Folks, it’s a closed question requiring either a “yes” or a “no.” And, based on Mr. Mulcair’s worldview, the answer should probably be “yes.” Was there even a hint of a yes or no in Mr. Mulcair’s answer? No. So the interviewer asked again. And again. And again. Until she finally gave up. Honestly, he came across as a hypocrite. 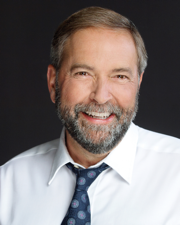 This past week, I was watching CTV Newsnet when Mr. Mulcair was interviewed by Sandie Rinaldo. To lead off her interview, Ms. Rinaldo quoted Liberal leader Justin Trudeau, who says he supports the capacity of Canadian troops to defend themselves. “Do you agree with that?” she asked Mr. Mulcair. Huh? Isn’t he criticizing someone for not answering specific questions by not answering a specific question? Again, a closed question. Yes or no would be good to hear, especially from someone who criticizes others for not answering specific, direct questions. This doesn’t pass the sniff test on a number of levels. If I was a member of Canada’s armed forces, I’d be miffed. You mean to tell us that we shouldn’t defend ourselves, regardless of what the politicians say in their squabbles with each other? It also illustrates the absolute foolishness of staying on message. As I’ve said many times during interviews and in my media training program, politicians are the only ones who could possibly get away with this tactic (but why would they, when a better alternative is available? ), which I believe is an outdated paradigm in an information-driven, media-savvy world. Mr. Mulcair has until October 19—the date of Canada’s next federal election—to get it right. His predecessor did, probably because he knew he was fighting his last fight. Mr. Mulcair should go back and watch Jack Layton’s interviews prior to the last federal election. Jack provided a refreshing perspective on treating audiences with dignity and respect. More often than not, he answered questions clearly and concisely, and communicated effectively. I believe Jack’s performance is a huge reason why Mr. Mulcair currently resides at Stornaway, the residence of Canada’s official opposition. If he hopes to stay there (or potentially move up in the world), he should gain insight from Jack’s cogent example, and learn how to answer questions as a means of treating audiences with respect, and ultimately managing interviews to strategic gain—without exhibiting the same behaviour for which he’s criticizing others.